For years we had a rhubarb plant tucked in an obscure corner of the back yard. We gave it little thought other than to acknowledge its intended purpose. The rhubarb stood heel-to-heel with a huge holly bush, our sentries assigned to guard a tiny crawl space under the house. No one ever fell into the well, thanks to the prickly holly and its partner the rhubarb, whose large wide leaves served as great visual cover. When winter arrived, the rhubarb would fade away and return the following spring to rise up and do its job all over again. At one point early on, I got to wondering about the rhubarb long enough to learn that its leaves are poisonous due to high levels of oxalyic acid. After that, I viewed it with caution and never entertained the idea of bringing it into the house. When rhubarb was listed on menus I would pass. I was not interested—besides, there were plenty of other good things to eat. All of that changed recently when a friend dropped off a few stalks of rhubarb, proudly sharing the latest in spring offerings from his garden. 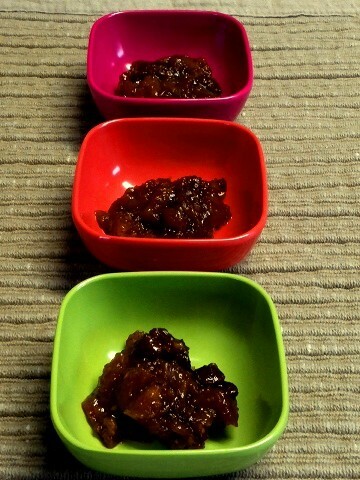 We got to talking about rhubarb in chutney, which he claimed delicious. Chutney! The magic word. Before I knew it, I was firing up my Instant Pot pressure cooker ready to see how fast I could whip up my own batch. 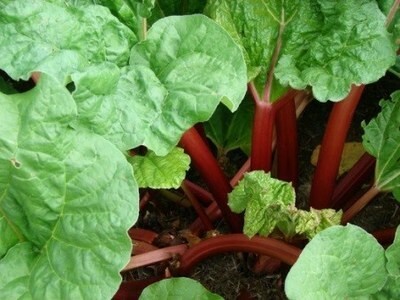 These rhubarb stalks were small and tender, unike the big thick hummers that I recall. 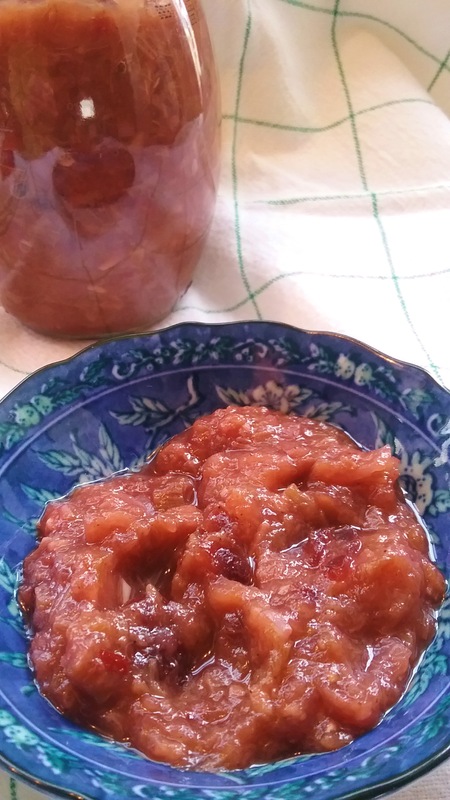 I could have used one of my many chutney recipes, but rhubarb’s sour bent makes it quirky. I opted for a Bon Appetit recipe from April 1994 from Epicurious. Still, I tweaked it, cut it in half (the reluctant one here), and added a Gala apple for a touch of natural sweetness to counteract the astringency of the rhubarb. Thanks to my glorious pressure cooker, chutney which normally takes 40 minutes or longer to cook down was out of the pot and stored in its own container in under 30 minutes. As with other chutneys, an overnight rest will blend and further improve flavors. This rose colored chutney is complex and nuanced—I am certainly a believer now, and I will return to the well! All channels are open for rhubarb. Inspired by a Bon Apétit recipe from 1994, via Epicurious. Heat the brown sugar, cider vinegar and flavorings through the dried red pepper flakes until the brown sugar has dissolved. Add the remaining ingredients and bring to a simmer. Set pressure cooker for 5 minutes, allow the pressure to reduce naturally for about 5 minutes and use the quick release. It will be slightly separated. Mash or press with a spoon to break up chunks and forms a cohesive sauce. Allow to cool and chill overnight if time allows. Yield: about 2 cups. There’s nothing like a tree-ripened peach, one so succulent that its perfumed juices dribble down your chin and slurping noises are the norm. I have had my share of this year’s Texas peach crop and have specially enjoyed the local Hill Country beauties from Fredericksburg and Stonewall. With visions of peach season quickly coming to an end, I decided to prolong their presence by transforming a few into mouthwatering chutney [truthfully, another mouthwatering chutney]. Perhaps this was prompted by a recent Saveur splash celebrating its 150th issue, which included a recipe for Major Grey’s Chutney, considered one of the world’s 150 most classic recipes. Over the years plenty of purveyors have offered their versions of Major Grey’s chutney. With its roots likely embedded in 19th century British India, it is anyone’s guess whose recipe is most authentic. I was intrigued: but chutney does that to me. Saveur’s recipe called for simmering mangoes, plenty of ginger, onion, garlic, raisins and warm spices for two hours. At one time I suspect tamarind paste would have also been included. 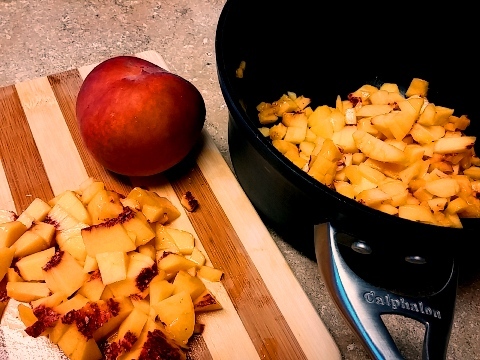 My own alterations started with cutting the recipe in half for a first run and the swap out of peaches for mangoes. I reduced the amount of sugar and glad that I did, because it was still quite sweet. I recall Major Grey’s as thick, sweet and exotic. I further increased the lemon juice and threw in half of a juiced lemon during the cooking process. 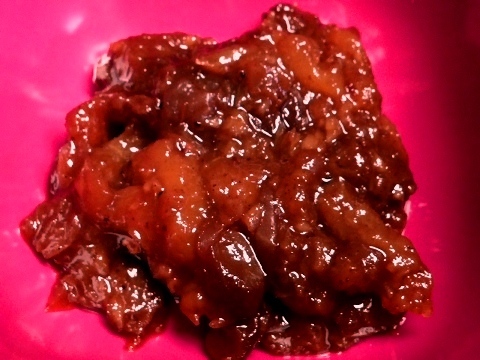 Since I was making a smaller quantity, my chutney was well-simmered and thickly textured within 1-1/2 hours. The results were very nice, indeed: a dark, complex, well-rounded sauce with just enough heat to catch your attention. Yes, I’d say that the peaches make a worthy contribution. In 2-quart pan, place all ingredients,b ring to a boil and reduce heat. Simmer about 1-1/2 to 2 hours, stirring occasionally until thick. Transfer to clean jar and store in refrigerator for about 2 weeks. Makes 2 to 3 cups.